Home / غير مصنف / UFO news: Does THIS photo prove NASA is lying about alien life in space? UFO news: Does THIS photo prove NASA is lying about alien life in space? Notorious UFO hunter Scott Waring has accused NASA of doctoring its space photos to conceal evidence of aliens from the public. Mr Waring, who runs the website UFO Sightings Daily, said NASA has “deliberately altered” its photos of Asteroid Ryugu and Asteroid Bennu to keep the public in the dark. According to the conspiracy theorist, pictures of the distant space rocks show clear evidence of alien UFO activity. Mr Waring found the supposed UFO in question between two canyon walls, hidden away on the asteroid. He claims the alien spacecraft was hidden there “for a long time” and has only now seen the light of day. The UFO hunter also claimed he has found a similar spacecraft tucked away on the Earth’s Moon. He said: “The UFO looks very similar to one I found in about 2013 and look at the size of this UFO. Mr Waring then accused the US space agency NASA of tampering with its latest batch of Asteroid Bennu photos, which NASA published online. The conspiracy theorist accused the space agency of making the asteroid appear farther away than it actually is to obscure the amount of detail seen on its surface. He claimed NASA “lied” to keep the truth of alien structures on Bennu a secret. 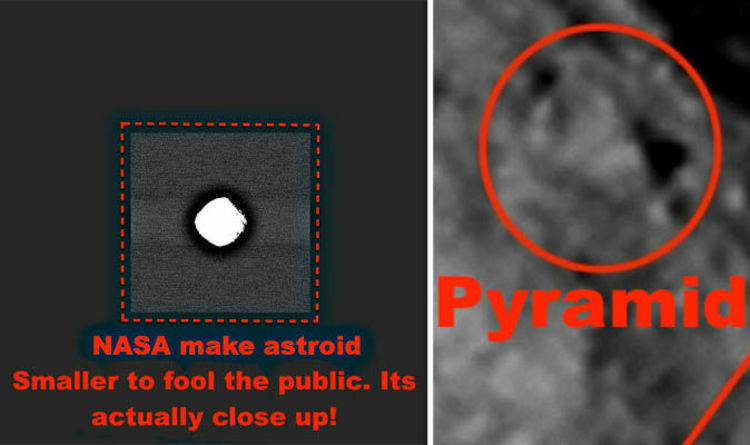 Some of these photos supposedly show a giant pyramid on the asteroid’s surface and a “square structure with windows or entrance openings along its sides”. Mr Waring wrote on his website: “So why did NASA want to make asteroid Bennu look smaller and farther away than it really was? In June this year, the Japanese spacecraft Hayabusa 2 rendezvoused with Asteroid Ryugu in a bid to land exploration drones on its surface. On September 21, the first two Hayabusa rovers successfully touched down on the asteroid in a historic moment for space exploration. READ MORE: Did NASA just film an ‘Earth-sized ALIEN CUBE’ entering the Sun? However, since the Japanese probes landed on the asteroid, scientists and astronomers have not found any evidence of alien life. Instead, Mr Waring may have fallen to the effects of mind trick known as pareidolia. UFO hunters typically fall for this effect when they claim to see faces, structures and spacecraft in shadows and rocks on planets or moons where they do not exist.